A new group, named 1250, calls for governments around the world to take action on methane. 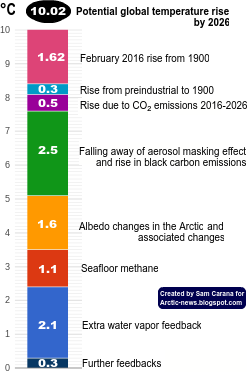 Just like 350 parts per million has become a popular target for carbon dioxide, the group similarly advocates a target for methane, aiming for a reduction of methane to 1250 parts per billion (ppb). On several occasions in April, 2013, the hourly average carbon dioxide concentration in the atmosphere of Mouna Loa, Hawaii, surpassed 400 parts per million (ppm). On May 9, 2013, the daily mean concentration of carbon dioxide in the atmosphere of Mauna Loa also surpassed 400 ppm. The National Oceanic and Atmospheric Administration (NOAA) comments that before the Industrial Revolution in the 19th century, global average carbon dioxide was about 280 ppm. During the last 800,000 years, carbon dioxide fluctuated between about 180 ppm during ice ages and 280 ppm during interglacial warm periods. 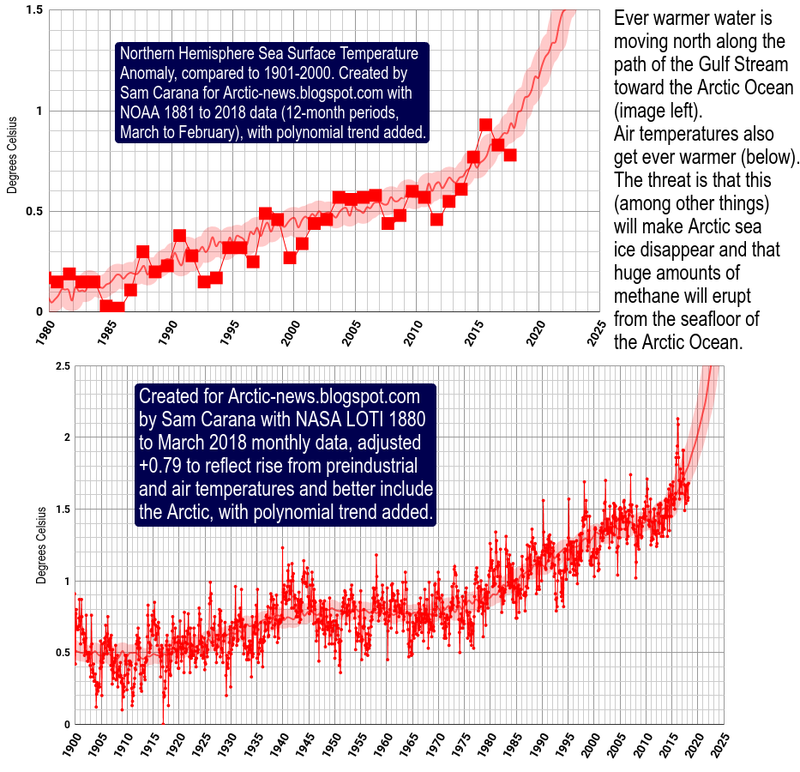 Today’s rate of increase is more than 100 times faster than the increase that occurred when the last ice age ended. On May 9, 2013, at another place on Earth, another significant event took place. 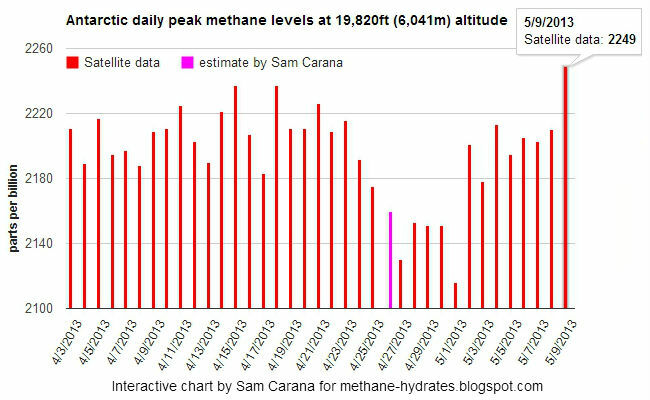 Methane levels above Antarctica reached a peak of 2249 ppb, highlighting the need for action on methane. The group 1250 advocates a similar target for methane, i.e. a reduction of methane to 1250 parts per billion. The launch of the group is accompanied by the release of the chart below showing the very high methane levels that have been recorded over Antarctica recently. The chart was prepared by Sam Carana, who also is a founding member of 1250. These very high methane emissions occur on the heights of East Antarctica. Antarctica is covered in a thick layer of ice. It appears that these very high emissions are caused by methane from hydrates that is escaping in the form of free gas bubbling up through the ice sheet. The danger is that such emissions will escalate, not only over Antarctica, but also on the Qinghai-Tibet Plateau and in the Arctic. For more on this, see the methane-hydrates blog. The group 1250 was set up specifically to address to need for a comprehensive approach to the challenges posed by climate change. The group now invites other groups to a dialogue regarding the details. The group has a website at http://1250now.org/ and encourages people to join its mailing list and sign its petition. The size of the heat shift needed to get at the sediments and decay out methane from methane hydrate ice and to see evidence at altitude above the continent from space seems definitely to be a one off event for a planet in its lifetime. 2C with eye - it is hard to think of the implications. One off - That's how I feel.. To be able to see and make mistakes for me ,here goes-Basically, What it looks like is the time to react with conventional measures and compromise of group thinking is over or exact reaction of life to high heat will take over. Group thinking sort of grown''s.